Even though I know next to nothing about wine, I do know that Wine is not a very descriptive name for a flavor. 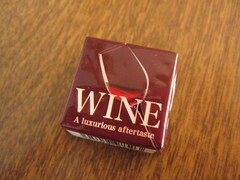 From the package, it can be assumed that this is a red wine flavored Tirol, but even that doesn't add much. My favorite red wine is Shiraz, which can have a strong bite, but there is a whole spectrum of red wines ranging from sweet to dry and beyond. The mystery Wine Tirol was purchased from napaJapan (4 for $3.29 US) just before Christmas, and limited quantities are still available. 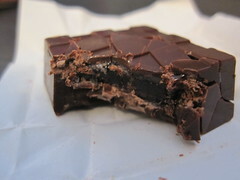 The dark chocolate was of decent quality and had a bit of a chocolate liquor flavor to it. In terms of texture, it had a good snap and a slow melt on the tongue. The jelly in the center was thick and sticky like a fruit gem, but didn't taste like wine. This Tirol was more like grape jelly in dark chocolate, and while it was very good, there was no hint of that "luxurious aftertaste" the packaging mentioned. Maybe they were aiming for dessert wine, but even that has more bite than this mild Tirol. There was a slight sourness at the finish, but it lacked the rich, complex end note that distinguishes sweet wine from grape juice. Even though this Tirol was tasty, it was misleading, so I have to account for that in my rating. This could be a good thing for those who don't like wine, but I wish Tirol had taken the concept just a bit further. I saw these once in a konbini, and never again. They were either very popular or very short-lived (or simply available in a limited area). I'm not really sad I missed it, but I'm glad you reviewed it!